The Motorcycle Riders Foundation (MRF) has learned that, in a hearing held this week by the U.S. Senate Environment and Public Works Committee, Senator Frank Lautenberg (D-NJ) repeatedly called for a national mandatory helmet law. The hearing, entitled “Opportunities to Improve Highway Safety,” focused on areas that need improvement when it comes to the landscape of highway injuries and fatalities. In his opening statement, Lautenberg said that there should be a mandatory motorcycle helmet law for all riders in America. This is typical for the 86-year-old senator. He has routinely attempted to put a federal mandatory helmet law in place before. Lautenberg currently chairs or sits on every single senate committee that has jurisdiction over roads and road safety. During this hearing, Lautenberg was not alone in his quest for an all-rider federal helmet law. As expected, the spokesperson for the Advocates for Highway Safety also voiced their opinion that a national helmet law is a good idea. Fortunately, the hearing didn’t only focus on the helmet debate; in fact, very little of it did. There were other issues covered such as impaired driving, distracted driving, and big trucks. As always, the MRF will keep you informed on this and all issues affecting motorcyclists from Washington DC. You never know what you’ll be facing at the start of a legislative season. ’09 was a tough year in the fight for motorcyclist’s rights, and this year we expected more of the same. So, prepared for the worst, it was a pleasant surprise that the 2010 session was a reasonably quiet one for us. Only once did SBU have to testify in committee to knock down one of twelve helmet bills. The other eleven didn’t even make it to committee. We were able to defeat this bill because a number of our members took the time to write to the committee chair voicing opposition. This carries a lot of weight in the member’s deliberations. Our mandate has never been anti-helmet – but we insist on the rider’s right of choice, and these appearances before the various committees from time to time allow us to carry this message. Likewise with the seven muffler bills that appeared this year. SBU’s position is that a loud muffler is a safety device that alerts motorists that there is a motorcycle in the vicinity. The introduction of bills to mandate mufflers that “prevent any excessive or unusual noise” really serve no useful purpose, since there are already a whole slew of laws already on the books that address this. If some biker roars around the canyons of Waikiki at 4 in the morning, SBU will have no sympathy when that bike is pulled over. Not all bills are bad for us. 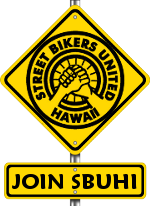 With the cooperation of the Hawaii Motorcycle Dealers Association, SB549 was signed into law by the Governor. For the first time, motorcycles are under the umbrella of the lemon law, which cars and other vehicle types have had for some years. SBU was approached by Senator Espero for assistance in getting this bill passed into law. We were happy to do so. Now if a customer buys a bike that is defective, there is recourse. So the Legislature will adjourn on April 29, and then we can all breathe a sigh of relief that once again the bullets were dodged. However, work continues for the SBU Board. The fundraisers have begun, with sometimes three or four early evening dinners a week to attend. 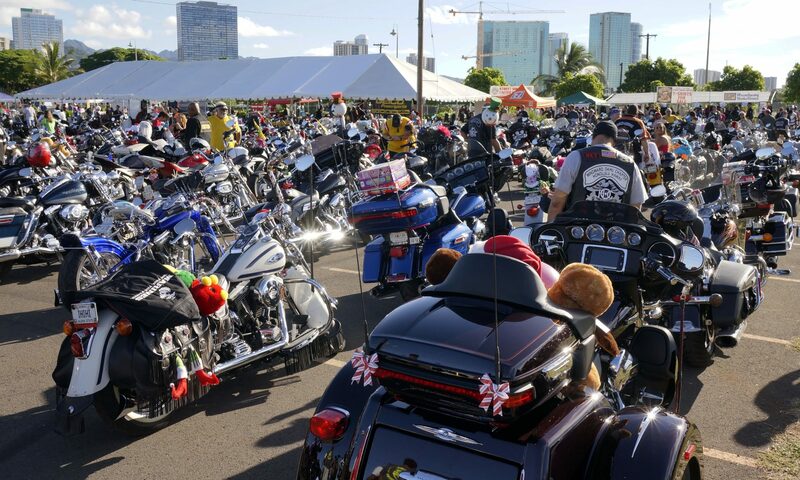 As a lobbying group for all motorcyclists in Hawaii, these fundraisers give us a chance to meet and greet the politicians, and support them through donations. In return, they can help in the fight against any nuisance bills that may pop up that affect motorcyclists. We’re still facing a nagging problem with no easy solution – getting motorcycle training ranges set up on the outer islands. This has become almost critical, since it’s rumored that the new rail system planned for Oahu will pass through the Leeward College range, meaning that the only training facility in Hawaii will almost certainly have to be closed. 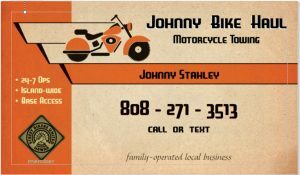 The DOT has undergone a shakeup in personnel, and their prior motorcycle liaison person is no longer there. We’re hoping for great things from her replacement, and perhaps some backing in the establishment of ranges. So as you see, there is a lot going on for SBU, and we sure could use a few extra hands on the State Board to join Sunshine, Ray, Rick, and myself to keep the organization moving forward. If you think you have an interest, give me a call at 291-8761.